Cue the Queen: Celebrating the Christmas Speech (BBC1, 7pm) Documentary on the history of the Queen's Speech every Christmas Day, which began in 1932 with King George V.
★ The Making of The Sound of Music Live (ITV, 8pm) Documentary going behind-the-scenes of last night's live televised musical of The Sound of Music. The John Bishop Christmas Show (BBC1, 9pm) Festive special of the stand-up comedy and light entertainment show. Guests are Kylie Minogue, Jess Glynne, Olly Murs, Sarah Millican, Danny Bhoy, Tom Allen & Andy Askins. BAFTA Celebrates Downton Abbey (ITV, 9pm) Special event to celebrate the global success of the period drama from London's Richmond Theatre. Hosted by Jonathan Ross. Cutting Edge: The Rich Kids of Instagram (Channel 4, 9pm) Documentary about the photo/video-sharing service, and how it's given super-rich youngsters the chance to show off their wealth. From Andy Pandy to Zebedee: The Golden Age of Children's TV (BBC4, 9pm) Documentary about the development of children's television. Mock the Week: Christmas Special (BBC2, 10pm) The final episode of series 14 is a festive special. How the Rich Live Longer (Channel 4, 8pm) Documentary on how the world's wealthiest people are using their money to extend their lives. Presented by Dr Christian Jessen. ★ We're Doomed! The Dad's Army Story (BBC2, 9pm) Comedy-drama showing how classic BBC sitcom Dad's Army was created in the mid-1960s by Jimmy Perry and David Croft. Starring Paul Ritter, Richard Dormer, Stuart McQuarrie, Sarah Alexander & Sally Phillips. The Supervet at Christmas (Channel 4, 9pm) The final episode of series 4 is a festive special. Michael Buble's Christmas Show (Channel 5, 9pm) Fifth festive special from the Canadian crooner. Guests are Celine Dion, Tori Kelly & Sharon and the Dap-Kings. A League of Their Own: Christmas Party (Sky1, 9pm) Festive edition of the sporting comedy quiz show. Take That: These Days on Tour (BBC1, 10.35pm) Documentary on the group's latest tour, as a three-piece. Posh Pawn at Christmas (Channel 4, 8pm) Festive edition of the fly-on-the-wall documentary at a pawnbrokers. Snow Chick: A Penguin's Tale (BBC1, 8.30pm) Wildlife documentary following the first few months of an emperor penguin born in midwinter. Boomers Christmas Special (BBC1, 9.30pm) Festive special of the comedy about three retired couples. Starring Philip Jackson, Alison Steadman, Paula Wilcox & Stephanie Beacham. Christmas Shopping Fever 2015: John Lewis and the Retail Race (BBC2, 9.30pm) Documentary going behind-the-scenes of the famous store and how it handles the Christmas period. Detectorists Special (BBC4, 10pm) Festive edition of the comedy about two amateur metal detectors. Starring Toby Jones & Mackenzie Crook. ★ Alan Davies: As Yet Untitled – Christmas Special (Dave, 10pm) Festive edition of the show, with guests Jason Manford, Jo Joyner, Joe Lycett & Reverand Richard Coles. Professor Branestawm Returns (BBC1, 5.20pm) Second special of the comedy-drama about an absent-minded professor living in a small English village. Starring Harry Hill, Madeline Holliday, Simon Day, Vicki Pepperdine, Sophie Thompson, Diana Rigg & Steve Pemberton. Jamie's Night Before Christmas (Channel 4, 7pm) Cookery special where Jamie Oliver helps viewers with their Christmas dishes and recipes. Pointless Celebrities: Christmas Special (BBC1, 7.10pm) Panto themed festive special of the gameshow. Guests are Jeffrey Holland, Su Pollard, Alison Hammond, Louise Jameson, Colin Baker & The Krankies. Would I Lie To You at Christmas? (BBC1, 8pm) Festive special with guests Bill Bailey, Ruth Jones, Jo Brand & Kelly Holmes. All Aboard: The Sleigh Ride (BBC4, 8pm) A two-hour sleigh ride filmed in Karasjok, Norway, across 200 miles. My Crazy Christmas Lights (Channel 4, 8pm) Documentary about the many people around the UK who decorate their houses with lights and decorations. The Abba Christmas Party (ITV, 8.30pm) Music special hosted by Paddy McGuinness, featuring Susan Boyle, Union J, Shayne Ward, Catherine Tyldesley, Scouting for Girls, Daniel O'Donnell, The Feeling, Amy Walsh, and more. The Great History Quiz: The Tudors (BBC2, 9pm) Quiz special where two teams of historians answer questions on Tudor life. 8 Out of 10 Cats Christmas Special (Channel 4, 9pm) Festive special of the gameshow. Guests are Peter Andre, Seann Walsh, Roisin Conaty & Joe Lycett. Morecambe & Wise Christmas Special (Channel 5, 9pm) Repeat of the iconic double-act's Christmas special from 1981. Peter Kay: 20 Years of Funny (BBC1, 9.05pm) Documentary celebrating the comedian's two decades in the industry. Through the Keyhole (ITV, 9.45pm) Christmas special of the gameshow. Guests are Stephen Mulhern, Claudia Winkleman & Jimmy Carr. ★ Walliams and Friends (BBC1, 10.05pm) Sketch comedy special where David Walliams is joined by a variety of guests, including Joanna Lumley, Morgana Robinson, Mike Wozniak, James Greene & Barunka O'Shaughnessy. Not Going Out Christmas Special (BBC1, 10.45pm) Festive edition of the sitcom. Top of the Pops Christmas 2015 (BBC1, 2pm) Festive special of the iconic pop show, featuring Coldplay, Jess Glynne, Ellie Goulding, LunchMoney Lewis, Sigma and Rita Ora, Hozier, Years & Years, James Bay, Omi, Fleur East, Nick Jonas, and more. Cameraman to the Queen (ITV, 3.10pm) Documentary following the royal cameraman Peter Wilkinson, who filmed the Queen at key engagements. Stick Man (BBC1, 4.45pm) Animated adaptation of the children's book by Julia Donaldson about the eponymous character's adventures across the seasons as he flees from a playful dog. Narrated by Jennifer Saunders. Voices of Martin Freeman, Hugh Bonneville, Russell Tovey, Rob Brydon, Sally Hawkins & Anouska White. Doctor Who (BBC1, 5.15pm) Christmas special of the sci-fi adventure with The Doctor reunited with River Song for a caper involving a diamond heist. Starring Peter Capaldi, Alex Kingston, Matt Lucas, Greg Davies, Philip Rhys, Rowan Polonski & Robert Curtis. Paul O'Grady: For the Love of Dogs at Christmas (ITV, 5pm) Christmas special of the show spending time at Battersea Dogs & Cat Home in London. Strictly Come Dancing (BBC1, 6.15pm) Christmas special of the celeb dancing contest. Gogglesprogs (Channel 4, 8pm) Special version of Gogglebox, focusing on children and the things they're watching. 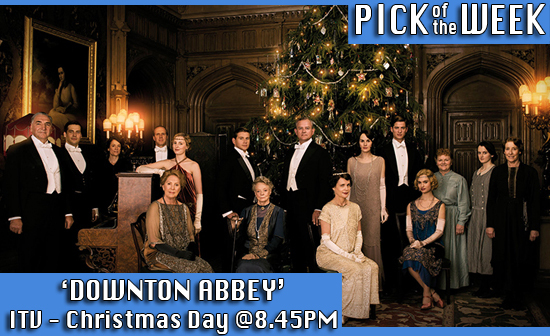 ★ Downton Abbey (ITV, 8.45pm) Christmas special and the last ever episode of the period drama. Darcey's Ballet Heroes (BBC2, 8.50pm) Documentary where ballet dancer Darcey Bussell meets some of her heroes and inspirations in the field. Alan Carr: Chatty Man (Channel 4, 9pm) Christmas special of the chat show, with guests Samuel L. Jackson, John Bishop, Keith Lemon, Catherine Tate, Lorraine Kelly, Emma Willis, Marvin Humes, One Direction & Little Mix. Mrs. Brown's Boys (BBC1, 9.45pm) Christmas special of the sitcom. Michael McIntyre's Big Christmas Show (BBC1, 10.25pm) Special of the chat show, with guests Dame Edna Everage, Dara O'Briain, Ellie Goulding, Tom Jones & Paul Zerdin. Our Cilla (ITV, 10.45pm) Documentary on the iconic singer and TV personality, four months after her untimely death. The Nation's Favourite Disney Song (ITV, 6pm) Countdown of the UK's most beloved Disney tune, narrated by Stephen Mulhern. Featuring Marge Champion, Karen Dotrice, Kristen Andersen Lopez, Robert Lopez, Harry Judd, and more. Shaun the Sheep: The Farmer's Llamas (BBC1, 6.10pm) Special edition of the Aardman animated character. Britain's Favourite Children's Books with David Walliams (Channel 4, 6.30pm) Countdown of the UK's best-loved books for kids, featuring Julie Walters & Martin Freeman. Surprise Surprise (ITV, 7pm) Christmas special. Top Gear: From A-Z (BBC2, 8pm) Countdown of the motoring show's best moments. Narrated by John Bishop. Peter & Wendy (ITV, 8pm) Twist on the J.M Barrie classic, where a 12-year-old girl admitted to Great Ormond Street Hospital finds herself stepping into the role of Wendy Darling and going to Neverland. Starring Laura Fraser, Paloma Faith, Stanley Tucci, Hazel Doupe & Zachary Sutcliffe. Inside Lego at Christmas (Channel 4, 8pm) Documentary follow-up to The Secret World of Lego, going behind-the-scenes of the toy firm at Christmas. A Gert Lush Christmas (BBC2, 9pm) Christmas comedy-drama about a young man introducing his new girlfriend to his parents at Christmas. Starring Russell Howard, Hannah Britland, Neil Morrisey, Sophie Thompson, Dougie McMeekin & Kerry Howard. The Big Fat Quiz of the Year (Channel 4, 9pm) Return of the annual comedy quiz show. Hosted by Jimmy Carr with contestants Rob Brydon, Richard Ayoade, David Mitchell, Claudia Winkleman, Greg Davies, Jo Brand, Simon Pegg, Heston Blumenthal, Olly Murs, Rita Ora, Charles Dance & Jon Snow. Country Strife: Abz on the Christmas Farm (BBC2, 10pm) Festive edition of the documentary series. ★ Fungus the Bogeyman (Sky1, 6pm) Live-action adaptation of the Raymond Briggs classic story. Starring Martin Clunes, Fay Ripley, Clare Thomas, Charlie Hicks & Mak Wilson. Harry Price: Ghost Hunter (ITV, 8.30pm) Drama about the famous ghost hunter and sceptic Harry Price, investigating a politician's haunted home. Starring Rafe Spall, Cara Theobold, Richie Campbell & Lewis Reeves. Most Shocking Celebrity Moments 2015 (Channel 5, 9pm) Countdown special. U2 – Innocence & Experience Live in Paris (BBC2, 10pm) Coverage of the band's tour of the French capital. Miranda Hart – My What I Call Live Show (BBC1, 11pm) Coverage of the comedian's live tour of stand-up comedy, sketches, and song-and-dance numbers.